If you’re in the market for a new roof, you know how many materials there are to choose from. Clay tile roofs are very attractive and have become a favorite over the past few years, particularly in warm climates. Slate tile has been around as a roofing material for hundreds of years and is still a popular choice. Recently, concrete tiles have also become more and more common on both residential and commercial buildings. • Metal shingles: Let’s face it – metal roofs hold up remarkably well. And now, there is a huge variety of colors and styles to choose from. They’re less expensive than both clay and slate, and they’re more durable than concrete, which can be fragile and difficult to walk on. Plus, metal is recyclable. 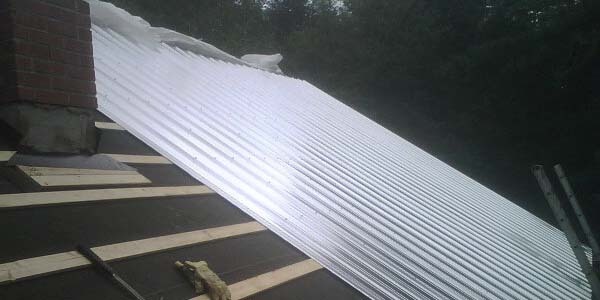 For our money, metal shingles are the way to go. • Asphalt shingles: As great as metal is, it can be a little pricey. If cost is a concern, choose good old asphalt shingles. True, they don’t last forever. On the other hand, they’re inexpensive, easy to install and easy to repair. Do keep in mind, however, that asphalt is susceptible to algae, so if you live in a wet climate, it’s best to choose another material. One more word about roofing material: we believe that #30 asphalt felt is more effective than underlayment. If you choose underlayment, you should know that it’s typically more expensive than felt.